Lenú sits alone on the beach, in the dark. The air is warm, the breeze off the ocean cool and sweet. The sand has cooled down, slightly damp to the touch; she burrows her heels and wiggles her fingers, and the grains make room. The waves crash, soft but relentless, a welcome hum that ensures, just as the darkness does, that she feels properly alone, unobserved, unheard. She’s free to cry as though no one will ever know, and in fact, no one will. The breeze whips her hair and the hem of her skirt, and she cries, and the cry is a relief, a blessing. Her 15-year-old heart is a powerful muscle, and it aches beautifully. It stirs up a longing, terrible and marvelous. The sand was cold, gray-black in the moonlight, the sea scarcely breathed. There was not a living soul and I began to weep with loneliness.... What signs did I carry, what fate? I thought of the neighborhood as a whirlpool from which any attempt at escape was an illusion. Then I heard the rustle of sand, I turned, I saw the shadow of Nino. In a better world, this review would center on how acutely Saverio Costanzo, Elena Ferrante, and Margherita Mazzucco communicate the almost unbearable teenaged pang of loving someone who doesn’t love you back. It would praise that scene, and see all else through the lens of gorgeous, dreadful young love. That it cannot do so is not a failing on the part of My Brilliant Friend. It’s a failing of the way things are. That scene, with Lenú on the beach, rings so true that it makes hearts much older than 15 wring with just a touch of that same kind of longing. But that’s only one scene. There are others, and they’re every bit as honest as that cry on the beach. His mustache pricked my upper lip, his tongue was rough. Slowly he left my mouth, took away his hand. Constanzo and the rest of My Brilliant Friend’s writing team don’t pull their punches with “L’isola (The Island).” Not even a little. In setting up what seems, at first, to be the series’ first Lenú-centric hour, they let the story unspool slowly, like letting out the line on a kite, and the episode flies higher and higher. My Brilliant Friend here feels, for the first time, like it’s daring you to not buy plane tickets to Italy (specifically Ischia); everyone and everything is beautiful, from the adorable kitchen bed Lenú has to pack up each morning to the adorable British children to the adorable swimsuits. Lenú embraces the sun, then the ocean, then the people. She feels ugly and out of place, then less so. She reads, she makes friends, and she falls in love with a boy who doesn’t love her back. But he might like her a little. The episode makes clear that even when out of Lila’s physical orbit, Lenú’s best friend still casts a long shadow; Nino’s (Francesco Serpico) far-away stare when he contemplates the wonder that is Lila’s mind makes pretty clear that while he may have been enamored of both girls, there’s one that dazzled him in particular. Whether he’s drawn to Lenú’s mind, her sweetness, or her obvious infatuation with him, it’s clear that the interest Lenú shows is mutual, but there’s no far-away stare, and it seems that, at first, that’s the heartache to which we’re heading. And so the episode remains sweet, even if it’s also just a little bitter. That things get worse when Lila finally responds to Lenú’s many letters also makes a certain kind of sense. That’s the neighborhood to which Lenú refers while she sits on that empty beach, once again asserting its influence, dragging her back, just as Lila’s plight tugs at her to leave. That’s the sting, we think; Lenú gets to live with the idea of this boy, while Lila’s nightmare continues; Lenú gets at least the idea of love, while Lila gets only protestations that are far more akin to a desire to own, possess, and control. And then the poet walks into the room and does exactly what first Lila, then Nino, told Lenú he does. He behaved selfishly, and a woman paid the price. The sight of Lenú, frozen as a tear runs down her cheek, is the most haunting of this series by far, and while readers of the book will have known what’s coming, the impact is far greater (for this reader at least) off the page than on. The tears that rolls down her expressionless face. The quiet way she tiptoes out of the house. The narration, which tells us that the adult Lenú will not have escaped that moment, decades later, and which also tells us how deeply she internalized the shame she feels. The willingness of Ferrante and My Brilliant Friend to acknowledge one of the most horrific aspects of sexual assault: the idea that the body can respond to an absolute violation (a topic also touched on with expert grace by this year’s Outlander season premiere). It creates in the viewer a longing for the right kind of pain, the pain you’re supposed to feel when you’re 15: That of sitting on a beach in the dark, crying because the smart boy with cute glasses doesn’t yearn for you the way you yearn for him, because he may like your friend better, because you don’t feel pretty and you don’t feel smart and you don’t feel special. That’s the right kind of pain. 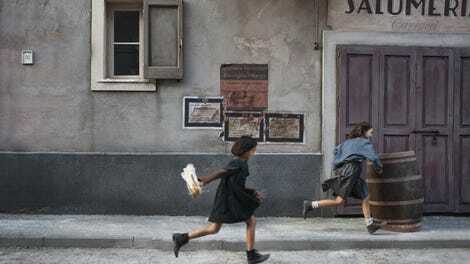 My Brilliant Friend gives us the chance to remember that pain, before showing us another. I love that, even when these girls are nothing but kind to each other, there’s an undercurrent of envy, competitiveness, and occasionally dislike. Friendships can be wonderful as well as complicated. Sarratore reading his own story out loud is insanely, perfectly terrible. The little touches in Lila’s storyline are excellent: Her obvious enjoyment of the TV and her shared smile with Melina, the grimace of satisfaction with Rino stands up for her again, it’s all so good.